One of the first products we reviewed on RelevantRankings.com was cordless drills. In just the last few years we have seen major improvements including new brushless motors and better batteries that have pushed the newest models to unprecedented levels of power and runtime found in a cordless drill. Buyers should be aware that most power tool companies, such as DeWalt, Milwaukee, Bosch and Makita, each normally have two versions of 18v cordless drills that they release. They have full-size or high performance models and compact versions that are lighter and smaller mainly due to the battery pack, but they also have less power. We tend to recommend the high performance models for professionals who need the maximum amount of torque and the compact cordless drills for home owners and DIY people. We took a look at the newest models and the ones that we have ranked previously then compared, reviewed, and re-graded each one to see which model would come out on top. Below you will find our reviews of the top 10 best cordless drills. Even though some companies have many models still available for sell, we tried to only include the newest 18v versions from each brand for our rankings. Do you need some more buying advice or tips? Then check out our Cordless Drill Buying Guide. The Milwaukee 2805-22 is our pick for the best cordless drill for professionals. It is by far the most powerful cordless drill we ranked with an unheard of max torque of 1200 in-lbs, however all that power comes at a price since it is the most expensive model on our list at $329. This M18 Fuel drill features a brushless motor and 5.0Ah XC RedLithium batteries which combined with Milwaukee’s RedLink Plus intelligence system ensures super long runtime, maximum performance, and protection from overheating or overload. It is a bit heavy at 4.8 lbs, but pretty compact at just 6.9 inches long. The biggest innovation on the previous generation 2705-22 was the Bluetooth connectivity with the One-Key system. On the Milwaukee 2805-22 this feature is improved upon and lets you control the settings on the tool from an app on your smart phone. You can also track and manage your tool which is a great bonus for companies who give tools out to employees. If it is ever lost or stolen you can lock out the drill so it can’t be used. We feel there are both pros and cons with this technology, but once you get used to it you will probably like it. Despite being a truly awesome cordless drill, all that power is unnecessary for many tasks including most jobs around the home. Therefore, unless you will really use the Milwaukee 2805-22 for jobs that demand that much torque then you would be wise to at least consider cheaper options. For the home user there are cheaper options better suited for you. The $316 Makita XFD07T came in second in max torque with an astonishing 1090 in-lbs which can handle the most demanding jobs. This 18V LXT drill/driver features a brushless motor which combined with 5.0Ah li-ion batteries provide up to 65% longer runtime than the previous generation 3.0Ah battery. The included charger can recharge each 5.0Ah battery in just 45 minutes which is the best among professional drills. The main drawback of the Makita XFD07T is the weight. At 5.8 lbs it is the heaviest drill on our list and can get tiresome with constant lifting. However, that bulk also makes the tool feel more stable and transfers less vibration into your hands. Overall the Makita XFD07T is another great choice for construction workers to throw in their toolbox. For homeowners or DIYers we recommend you look for a cheaper, lighter model due to the weight and price of this drill. We think the Ridgid R86009K provides the most value for home owners or DIYers due to its overall performance at the low price of just $139. We rate it as the best cordless drill under $200. 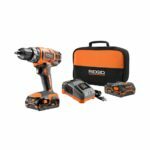 The other unbelievable feature on this drill is the best warranty possible – a full lifetime warranty provided you buy the tool from Home Depot and register it with Ridgid. That warranty will cover the tool and batteries, and really is unheard of at this price or any price. The R86009K features a brushless motor and has one of the best power to weight ratios you can get in a cordless drill – it weighs just 3.75 lbs, while having 650 in-lbs of torque. It comes with two 1.5Ah li-ion batteries, which don’t last all that long compared with the top tier 5Ah batteries on some other drills. However, they do recharge in 30 minutes. You can also buy larger, longer lasting batteries if you need them. The overall build quality and durability is a bit below some of the top brand like Milwaukee and Makita. However, since the warranty will cover you, you don’t have to worry about that. We highly recommend the Ridgid R86009K for casual users and home owners because it can handle 99% of tasks you will need it for, all for a low price and awesome warranty. For construction professionals you still might want to consider this cordless drill, but there will probably be some jobs that is does not excel at. 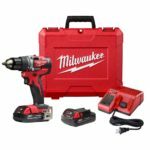 The $199 Milwaukee 2801-22CT is Milwaukee’s latest compact brushless 18v cordless drill in their M18 lineup of cordless tools. So far users truly love this thing, giving it a perfect 5 star rating at the Home Depot at the time of this publication. It has 500 in-lbs of torque in a drill that weighs just 3.4 lbs and measures 6.5 inches long. The 2801-22CT comes with two 2.0Ah Redlithium batteries that can recharge in 30 minutes. It also features the RedLink intelligence which provides overload and overheat protection so you won’t damage your tool. An all metal gear case rounds out the solid build quality. The warranty is pretty solid at 5 years for the tool and 2 years on the batteries, although nowhere near the Ridgid. Overall we would recommend the Milwaukee 2801-22CT for all users – from home owners to construction pros. 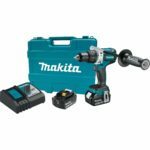 The Makita XFD12R specs are incredibly similar to the Milwaukee 2801-22CT and could just as easily be ranked ahead of it, but the slightly higher price of $209 knocked it below. The XFD12R is Makita’s latest brushless compact 18V cordless drill in the LXT lineup of cordless tools. The XFD12R has 530 in-lbs of torque in a drill weighing 3.4 lbs. It comes with two 2Ah li-ion batteries that recharge in a category leading 25 minutes. 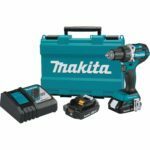 Overall the Makita XFD12R is another 18V cordless drill that can be used by everyone and we would not hesitate to recommend to all users. The DeWalt DCD991P2 is DeWalt’s heavy duty 20V Max brushless drill which sells for $299. It is lighter than other full-size, heavy-duty cordless drills at 4.6 lbs, while providing approximately 900 in-lbs of torque (820 UWO). Where the DCD991P2 really shines is in the batteries. It comes with two 5Ah XR batteries that some users have been reporting get 5-6 hours of runtime. That runtime will obviously vary depending on the load you put on the drill, but the point is they will last a really long time – on average probably a whole day worth of use. On the downside they take an extremely long 90 minutes to recharge. If you do jobs where you need a lot of torque and you already have some DeWalt cordless tools, then the DeWalt DCD991P2 is a perfect choice for you. These drills are built in the USA using global materials. 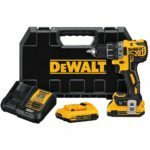 The just released DeWalt DCD792D2 is DeWalt’s latest 20V max compact cordless drill and sells for about $207. The new innovation on this model is the Tool Connect system in which you download an app to your phone and along with Bluetooth connectivity on the tool you can track, manage (Inventory Manager web portal), and customize the tool. This is a great feature for businesses that hand out tools for employees to use, so you can keep track of who has what and where those tools are at. The specs are similar to the Milwaukee and Makita compact models with approximately 530 in-lbs of torque and weighing 3.4 lbs. It comes with two 2Ah XR batteries that recharge in 35 minutes. 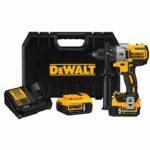 While the DeWalt DCD792D2 is a really good cordless drill, the Tool Connect system is not really needed for casual users and thus you might want to consider another model. Hitachi’s newest brushless 18v cordless drill is the $119 Hitachi DS18DBFL2. Despite that very low price, this thing packs a punch with 620 in-lbs of torque while weighing just 3.5 lbs. The DS18DBFL2’s main weakness are the included 1.5Ah batteries which won’t last very long and recharge in 40 minutes. However, you should get enough juice out of them to handle all but the most demanding jobs. Overall the Hitachi DS18DBFL2 is a good choice for anyone looking for a cheap cordless drill. For pros you might want longer lasting batteries, which you can buy. The Bosch DDH183-01 is built strong to handle the toughest worksite conditions. This $279 model features a durashield housing, all metal gearbox, and advanced motor and battery protection systems to prevent overloading and overheating. It also has Bosch’s KickBack Control which reduces dangerous torque reactions in a bind-up scenario. The DDH183-01 has a disappointing power to weight ratio by weighing in at 5.4 lbs and having 663 in-lbs of torque with a max speed of 2100 RPM. It also comes with 2 4.0 Ah li-ion batteries for longer run times which recharge in 35 minutes. Overall the Bosch DDH183-01 is a well-built drill that can survive tough jobsite conditions, but the torque is a bit low for a model weighing as much as this one does. We selected the Ridgid R860052K as the best cordless drill under $100. 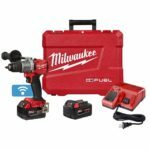 Priced at just $89 this drill and kit comes with two 1.5 Ah batteries that recharge in just 30 minutes. While they don’t last a long time, they will handle most jobs and most larger batteries will cost more than this this drill plus two batteries. The R860052K has a decent power to weight ration with 500 in-lbs of torque and weighing in at 4.75 lbs. The Ridgid R860052K also comes with the industry-leading lifetime warranty if you buy it from the Home Depot and register the product within 90 days of purchase. That means you get free parts, batteries, and service for life. We think the Ridgid R860052K is perfect for anyone looking for a cheap cordless drill. However, professionals probably should spend more money on a higher performing, better built unit. Cordless drills can be used on a wide variety of tasks from hanging pictures to building decks. It is important to know what projects you want your tool to be able to handle. Are you mainly going to be doing basic household tasks or do you plan on tackling serious construction? While keeping this in mind, when shopping for cordless drills there the three main factors you should consider are battery, torque and weight. The battery is the most important criteria since it supplies the power for the tool. Cordless drills come in different voltages ranging from 7.2v up to as much as 36 volts. The most popular is 18v and is a good compromise for homeowners and people who use their power tools for a living. The best battery composition is lithium-ion, or Li-Ion for short. Stay away from older NiCd or NiMH battery technology since they take longer to charge and won’t last as long through many recharging cycles. The amount of run-time is measured in amp-hours, or Ah. On full-size or heavy duty models you will normally see either 4.0Ah or 5.0Ah battery packs which are longer lasting but bulkier, while on compact models you will usually find 1.5Ah or 2.0Ah packs which don’t last as long but are more compact. Most models you buy come with two batteries and a charger so one can be charging while you are using the other one. Torque is simply the measure of the amount of twisting force the drill applies in inch-pounds. The higher the torque, the better the drill can handle tough tasks such as driving lag screws or drilling large diameter holes through wood or metal. Other factors related to torque are the number of clutch settings and the speed in RPM’s. The clutch setting along with the different speed settings allow you to control the drilling / driving at the correct pace. Many companies now feature computer controlled technology to help apply the correct amount of torque without damaging the tool. One factor that many people overlook, but is very important is weight. It’s important because you want something that is easy to use and these things can get heavy through constant use or if you are holding it above your head. Generally a lighter model is also smaller in size which makes it easier to get into tougher spots. Manufacturers usually offer a standard or heavy-duty model which is heavier, but has the most torque and larger Ah batteries and a compact model which is smaller and lighter, but has less torque and less Ah batteries. Some other features you might want to look for include a fuel gauge, work light, an auxiliary handle, belt clip, and warranty length of both tool and batteries. Also remember that many brands now offer kits with multiple cordless tools that all use the same batteries. So if you use your tools for a living you might want to find a brand that offers all the cordless power tools you need so you can switch your batteries between them. In summary we recommend an 18v Li-Ion model. You have to decide how much the other factors matter to accomplish the tasks you need to do. Have the 18 volt and twelve volt millwaukee great tools.